For the lifesaver in your life. 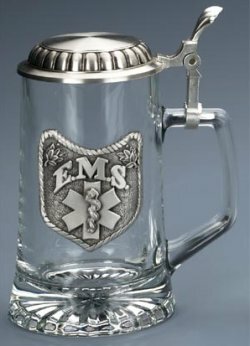 The Emergency Medical Service badge and symbol is embossed in pewter on the front of the stein. Perfect for personalizing on the body or the lid. The smooth, sturdy glass body is tapered and has a starburst light-reflecting pattern on the bottom; the smooth heavy gauge lid is removable! The stein has a special threaded hinge pin.